Carrefour issues a coupon on Mondays for 30% of the value you spend on refrigerated dairy. You can spend your coupon on anything in the store on your next visit. The coupon is valid for two weeks. Carrefour has competitive prices on refrigerated dairy on a day to day basis versus the other supermarkets. Disco has a promotion on Mondays, Tuesdays, and Wednesdays where if you buy 4 Sancor products you only need to pay for 3. This promotion is quite competitive although you have to buy 4 items to get the 25% discount. 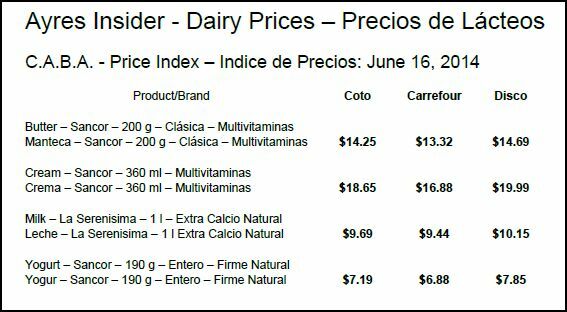 Disco’s prices are the highest out of the “Big 3” supermarkets so the savings are about 14% on Sancor products compared to Carrefour’s regular prices. Coto doe not offer any promotion specifically related to refrigerated dairy that we are aware of at this time. On a day to day basis their prices are midway between Carrefour and Disco. Los Lunes, Carrefour, tiene los mejores precios para los productos lácteos refrigerados. Lo llaman “Lácteos Lunes”. 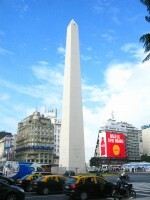 This entry was posted in aliment and tagged aliment, alimentos, Argentina, Buenos Aires, C.A.B.A, Capital Federal, comparación de precios, dairy, estrategias de compra, lácteos, lácteos lunes, price comparison, SanCor, shopping strategies, Supermercado Carrefour, Supermercado Coto, Supermercado Disco on June 17, 2014 by ayresinsider.